Are you afraid to eat fat? I was until I began learning more about the benefits of filling my plate with healthy fats. Though I still feel like a “bad girl” for eating so much fat (especially the saturated kind), I’ve found some real benefits to a gluten free high fat diet (also known as the ketogenic diet) for those struggling with autoimmune issues like Celiac and Leaky Gut Syndrome. In this podcast, I breakdown exactly what a gluten-free high fat diet looks like and why it might benefit you. Plus, you’ll probably learn some surprising facts about fat and protein that will hopefully open your mind to eating the right kind more often! 00:22 — Introducing Maria Emmerich, author of “Keto-Adapted” and a ketogenic diet expert. 02:01 – Maria’s story: How she turned her health around as an overweight college student, with IBS and acid reflux, and feeling awful and why fat is so important for the brain. 04:40 – What is the ketogenic diet? 08:01 – Veggies to stay away from because of their carb content. 08:43 – What percentage of fat should your diet be and how a ketogenic diet can help fertility and menopausal issues. 10:31 – What happens to people with autoimmune conditions (like thyroid issues, osteo arthritis, fibromyalgia) on a low carb, high fat plan? 12:07 – Can women follow a ketogenic diet plan? What about anxiety, depression and concentration? 13:32 – What is intermittent fasting? 15:13 – How to get around eating more fat and dealing with other misconceptions around adding more fat. 17:09 – What about whole grains? What food is higher glycemic than jelly beans? Why are gluten-free food products the worse? 18:30 – Why replacing carbs with protein is not helping people heal. 20:46 – Key foods to add to increase fat intake. 24:56 – What does a typical keto dinner look like. 28:29 – How to contact Maria and closing remarks. Jennifer: Welcome back to the Gluten Free School Podcast. I’m your host, Jennifer Fugo. And today, we are going to talk about ketogenic living. Now if you don’t know what that is, it’s more or less living on a fat-based diet. On this podcast today, Maria Emmerich. She’s a wellness expert in nutrition. She’s also a best-selling author. She had struggled with her weight through her childhood and decided enough was enough. She understands the connection between food and how it makes all of us feel on the inside and out. Her specialty is brain neurotransmitters and how they are affected by the food that we eat. 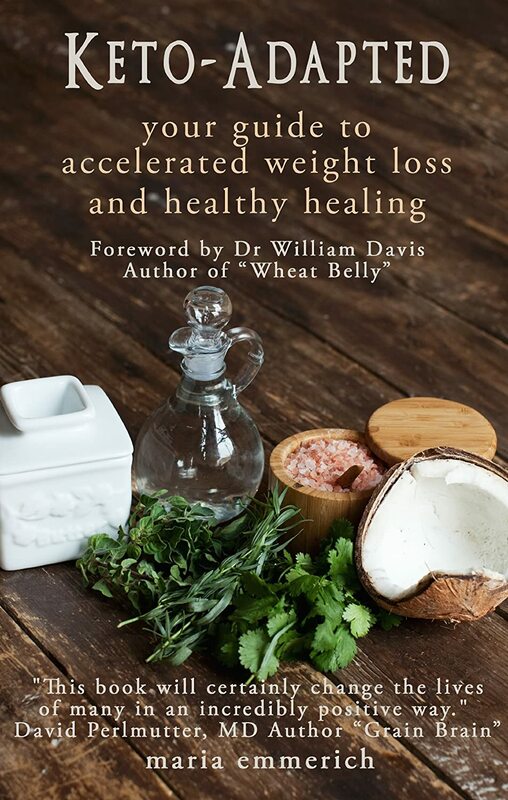 The really cool thing is that Maria has authored eight books with three nutritional guidebooks including The Secrets to a Healthy Metabolism as well as her latest book called Keto Adapted. We’ll definitely get her to explain what that’s all about because these books really beautiful, very awesome guides. And Maria, on your blog, you include a bunch of unique combination of innovative recipes. I must say I love your recipes. You use alternative ingredients and bacon to create some healthier options, easy-to-understand explanations of why these options are better for your health and she talks about how to eat and live a healthier lifestyle and including – she’s going to talk to us today obviously about ketogenic living, but a number of the issues that she helps people with includes diabetes, cholesterol, alopecia, Hashimoto’s and other autoimmune diseases and much more. So welcome, Maria. Thank you so much for joining us! Maria: Oh, I’m just honored to be part of your podcast. This is so great. Thank you so much for having me on. Maria: Well, basically, how this started was I grew up overweight. I was in college in nutrition. I was running marathons eating the calories I was supposed to do. I had IBS, acid reflux and low moods. Why wasn’t it working because I was eating this great food pyramid diagram? All of these grains that were supposed to be fueling my runs and I wasn’t feeling good. And so what I did was I started cutting out the carbohydrates and had some success with that. I started doing that in my practice, you know, “Let’s cut some of the carbohydrates out.” And then I started cutting more things like the gluten and all of these things causing the autoimmune responses and stuff and people started to heal, but I wanted to touch on why ketogenic is so much different than just a low carbohydrate gluten-free diet. What started happening was with the diabetics I was working with, their blood sugars were still too high. A lot of people do low carbohydrates, but they’ll replace all the carbohydrates with proteins. So they’ll do lean chicken breast with broccoli, steamed, right, or egg white omelet and their blood sugars weren’t getting any better. What I started diving into was this ketogenic diet. So instead of going high protein, we had to moderate the protein and go high in fat and amazing things started happening. Old clients that I had, I contacted them because if they didn’t heal totally, I felt bad so I was like, “We need to get better. Try this instead. Here’s a meal plan. Let’s go for this” and amazing things started happening, the weight started falling off. If you think about it, our brains and our cells are over 60% fat, why don’t we mimic that with our diet? I know Dr. Perlmutter whom you also know, he told me during another podcast a while back that the largest concentration of cholesterol is in the brain. Jennifer: It’s really important. So for people who don’t know what is a ketogenic diet, could you describe that clearly for us. You said what it’s not. You said it’s a little different than this low carb diet. What does ketogenic look like? Maria: Well, let me start out by – say with my dad, he traveled to Alaska and he met some of the Inuits who caribou hunt. He described to them – this was, gosh! I don’t know, ten years ago – how they know that they cannot survive on caribou alone because it’s too lean of a protein. They have issues and illnesses that come up when that happens, so they need to find a good fat source. And what they often do is when food is in abundance, they give the protein parts to their dogs usually and they eat the fat part. Jennifer: Wait, they don’t eat the protein? They eat just the…? Maria: Well, they don’t throw it all away. What my Dad found interesting is that we cut the fat off and give it to our dogs and we eat the protein part where they do the opposite. They eat a lot of the liver and the organ meats and a lot of the fat that we try to cut off and trim off of the chicken and everything. We get rid of the skin. That’s going to be their first form of nutrition. That’s where all these nutrition is. Every cell on the body can run off of glucose, which is sugar or it can run off of ketones. And if you think about an athlete who runs a marathon, they usually – and I still do run marathons with a ketogenic diet. I get a lot of comments like, “What? I’m an athlete, I can’t do this.” You can. If you run a marathon, you technically hit the wall at about mile 20. That’s because your cells only have about 2500 calories of glucose that it can use. So that’s why people do the goo and all of that. But if you run on fat, you have about 30,000 calories of fat that you can run on and fuel your body on. And what’s actually cool about this is there’s a guy that’s known as the skull runner and he won the ultra-marathon that went on this last year and he broke the record by about 21 minutes running it on a ketogenic diet. Jennifer: Oh, my gosh! Twenty one minutes? Wow! Maria: Yeah, that’s huge to break that record. That’s just how powerful this ketogenic diet is. Instead of being constantly nagged by food and when your blood sugar goes up and too low (that’s how hunger happens is as it’s falling), in a ketogenic diet, you keep that, your blood sugar nice and even. So I get comments all the time, “Well, Maria, on your meal plan, it says to have lunch, but I’m not hungry at lunch time. Can I push it up a little bit longer?” So that’s what often happens. You’re not plagued by those cravings and things like that. But yeah, again, a ketogenic diet is a high fat, moderate protein, very low carbohydrate diet. Everybody’s body is different. So if you have more muscle, more mitochondria – the mitochondria is the powerhouse part of your cells where fat oxidation actually takes place, the more mitochondria you have, the more that fat-burning that occurs, but also you can handle more carbohydrates than some because even for some – I mean, like sweet potatoes, that’s just way too high in carbohydrates for most people in a ketogenic diet. Even spaghetti squash, I would cut that out too because most people can’t even tolerate that with ketogenic diet. Jennifer: Wow! Because those are considered the healthy starches when you start to look at what are your less refined options or what are considered good paleo options. Jennifer: So that’s even too high in carbs for a ketogenic diet. Maria: Yeah. I am very extreme, but that’s why this works so well. I want clients to stay under 10% carbohydrates and that would just tip us over too much. Jennifer: Since you just said 10% carbs is sort of like the max, what would be the other percentages for fats and carbs? And we do. We get emails of before/after photos and it’s been wonderful. So the more I pushed them into not being so afraid of this whole fat mantra, a lot of good things start to happen. And not just weight loss. A lot of women are dealing with fertility and a lot of it has to do with – not everything. With Cancer, there’s a wide variety of issues, but with fertility, low progesterone is an often common cause of miscarriages and not being able to carry a child. And when you look into what makes progesterone, cholesterol does. And that’s why women who go through menopause, they oftentimes are mistakenly put on statin drugs. That’s because their low progesterone is causing their cholesterol to go up because cholesterol is trying to make this progesterone that’s not happening. The more fat – the yokes of the eggs has choline and all of these stuff that we’re told to not eat, the saturated fats help make that progesterone. So it helps with fertility, menopausal issues and all of that. Jennifer: And so you’ve worked with people or you’ve had experiences with people who have autoimmune conditions where they’ve gone on to giving this a try. What happens when they stick to the plan and they begin to turn over the carbs and say, “Oh, I’m not going to do this anymore. I’m going to stick with fat”? What happens when they do that? Maria: Well, I often recommend that they work very closely with their doctor if they’re on a thyroid medication because as they start to heal, if your TSH would get too low, then you’re starting to not absorb some of the nutrients you need for your bones and things like that. So again, a lot of times that they’re off armor or they’re off a lot of their medications and autoimmune disorders such as – I mentioned arthritis. I talk about that because osteoarthritis, the medications for pain is unreal on how expensive it can be. Again, our cells, they’re over 60% fat. And when you start to give those cells what they’re craving and desiring and needing, those cells start to heal. The common thing I get is that within a few days, their pain is diminished. They just can’t believe it. Those hydrated cells are just so happy that they feel so much better. They can start to move and fibromyalgia and all of that pain starts to go away. Jennifer: Well, the other thing too that I just want to point out is that you’ve mentioned women do this. Women are more than willing to give this diet a try. As I have shared, I have slowly been adding more fat intentionally to my diet just to see how I feel and I noticed that I feel better. Jennifer: I can function better with more fat in my diet. I don’t have these moments where I am ravenously hungry. That never happens. And I feel almost like my brain – I don’t know, like it’s brain food or something. I can’t even describe it aside from that. It’s really good brain food. So women do this too? They’re successful at it? Maria: Oh, yes, yes. I have the photos to prove it. And again, it’s not all about weight loss, but one of the things that I work with most is anxiety and depression. Again, I can’t say it enough, our brain, that’s what it is. It’s cholesterol and fat. It’s a fat hog. People who are dealing with depression, anxiety, they’re fueling your body with those proper nutrients and a lot of those other things too. They’re getting off their medication for anti-depressants that they’ve been on for 20 years. They’re just healing so well. Yeah, the mental acuity for focus and energy and all of that is really sharper. And that’s why – are you familiar with intermittent fasting? Jennifer: You can share it with everyone. Everyone might not be entirely clear with what that means, but you’re more than welcome to share what that is and talk about that. Maria: He talks about how there’s a genotype that is actually meant to fast, the hunter/gatherer that would have to hunt their food down for three days before eating. They actually thrive on intermittent fasting. I don’t want to get into too much of that, but I just wanted to say that the mental acuity and the fasted state is quite high too. But like Alzheimer’s, that’s Type 3 Diabetes where the brain can’t use glucose anymore, so what could it use? Ketones. Jennifer: And I think that’s another reason why Dr. Perlmutter who wrote Grain Brain and he’s a neurologist… For any of those who haven’t listened to that podcast yet, he is a practicing neurologist down in Florida and he really feels that not only is Alzheimer Diabetes Type 3, but part of the problem is we have the wrong fats and not enough fats in our diet. The refined carbs and added sugars and so much, so much sugar is just killing people. I know that there’s whole history behind what happened. Now saturated fat is starting to slowly make a comeback. But even as we were sharing my basic nutrition class I’m taking right now, it really is still about low fat/no fat and saturated fats are evil. So what are some of these – I don’t know, these misconceptions about fat because you’re living this lifestyle? What do you think there is there that maybe you could poke some holes in so that people could kind of change their mind about adding a little bit more fat into their diet? Maria: Well, I start out by really helping people understand what – we all know sugar is damaging. Disease doesn’t happen without inflammation. Inflammation is the stem of all disease and we know that sugar is inflammatory. Carbohydrates are inflammatory because whole grains or too much carbohydrate, that turns into sugar in your blood. Glucose molecules are long chains that once they get into the digestive tract, they break down into glucose – I should say like sugar, okay? Does that make sense? Maria: So it breaks down into sugar. Even like when I was saying the sweet potato, it breaks down into sugar into your blood, that’s why when you’re wearing a glucometer, your blood sugar will go up at that time. We don’t associate whole grains as sugar and we really should. For example, a pretzel is higher on the glycemic index than jelly beans. Maria: What’s more detrimental is the whole gluten-free food products out there on the shelf, that’s the worst thing that happened to gluten-free diet because they use a lot of things like rice flour. Well, rich flour has a hundred more calories per cup than white flour and about 50 more carbohydrates per cup. So when people buy the gluten-free pastas, the gluten-free bread, a lot of times they start to gain weight rather than lose it. Jennifer: This is what I’ve been telling people for a long time. Actually, it’s funny, I almost have made – I’m pretty good at this. Almost every single podcast, I have asked people about gluten-free bread because I have a post on my site, it says, “Why are you still eating gluten-free bread” and I still get hate mail about that post and they think that I’m an awful person for writing it. But the truth is I ended up with adrenal fatigue as a result of consuming that food. Jennifer: And I care. I want to tell you the truth. At least you can make an educated decision. So thank you. Jennifer: Exactly! So thank you for just putting that little piece, that little nugget in there. I’m glad I didn’t have to bring it up this time. Maria: Right, right. That is very inflammatory. So when we cut those things out, what do most people do? They replace it with protein. So what I’m saying is we need to cut the carbohydrates out to get rid of that inflammation that’s going on whether it be the inflammation of your adrenals, the inflammation of your thyroid, the inflammation of your joint. Cancer is a sugar lover. I mean, I won’t even get into that because there’s just so much to talk about. But when you cut the carbohydrates out, most people replace it with protein. The trick – what signified me, I don’t know, eight years ago, the diabetics still weren’t getting better. And so diving into, what macronutrient is the only macronutrient that doesn’t raise blood sugar, that all of our cells need and they crave it? Fat. So we need to cut the carbohydrates out. Moderate the protein so we’re not getting too much because you cannot store protein. You either use it or it turns into sugar. Did you know that? Jennifer: I did know that and a lot of people don’t. Yes, yes, ladies and gentlemen listening to this, that is absolutely true. It’s in a basic nutrition book. We covered that in my anatomy and physiology class. If you eat too much protein, it gets turned into sugar. And so if you moderate the protein, then what’s left? It’s the fat. Instead of just saying, “No, fat is good” and they’re like, “Yeah, yeah, yeah. I’ve heard that before,” I need them to understand what is turning into sugar in their body – too much protein does and carbohydrates do. You need something to fuel your body with, how about we try fat? Jennifer: High fat, no dairy, no gluten… oh, my gosh! So what are some of the key foods that you would tell someone to add in that would increase their fat intake? Maria: Well, I’ll start with the basics – coconut oil and MCT oil are the best because those produce ketones on their own. Whether you eat a high carbohydrate diet or not, they’re going to help with ketones. And this is why Alzheimer’s patients, I’ll have them take ‘fat bombs’. You’ve heard of those? Maria: Oh, fat bombs are basically like coconut oil. Most of the time, people use stevia in there, maybe some cocoa powder. I have something called the keto-fudge and that’s right up there on the blog. Jennifer: I will link to it. I will link to these recipes, so people can go and check them out. Maria: Yeah, the keto-fudge is a hit. They say their kids love it. It’s just basically a high dose of coconut oil. You can do a piece of that. A lot of times, chocolate cravings, they’re linked to magnesium deficiency. So if you’re craving chocolate, maybe you should add some magnesium. But I was going to say those oils are really important for getting to be keto-adapted. I do want to say organ meat. I know people are going to be like, “What? You lost me. I’m not listening anymore.” I do not like organ meat, so what I do is when I make meatloaf or meatballs, chili, some sort of soup, I grind it up just like it’s ground meat and add that to whatever we’re cooking, whatever we’re making. Jennifer: And that’s how you get around that because I have a hard time with the organ meat. It’s sort of gross, you know? Maria: No, I despise it. Sometimes I’ll ask my husband to make the meat loaf or the chili or something, so I don’t know what’s in there. I just don’t like. And another thing I hide in those foods are herbs. Herbs are one of the best forms of phytonutrients. People are also like, “I can’t get any fruit. How am I going to get my vitamin C” and all of that types of stuff. I prove to them with charts that oregano has ten times the amount of vitamin C than an orange does, but you wouldn’t think of that because who’s pushing herbs on people? Other things I push are avocados. So what happens when people go low carbohydrate. At first, you lose a lot of water in your cells. That’s why people don’t feel good. They have low energy when they start a low carbohydrate. And that’s why it’s not well formulated – or a ketogenic diet I should say. Avocado is a great source of potassium. You lose a lot of potassium and electrolytes when you lose a lot of liquids in your diet, in your body. And that’s why you get heavy legs. Walking up the stairs, you’re like, “Geez, I’m winded already,” those heavy legs. It’s usually just low potassium. So adding in avocado and again, herbs are a great source of potassium. Jennifer: What about nuts? Do you suggest nuts and seeds as well? Maria: It depends. Again, that’s a common allergen that can be linked to autoimmune diseases. Most of my meal plans are not free. I know you’re like, “What?” But it’s kind of an experiment. You cut those foods out and you slowly add those in and see how your body responds. Some people are just fine. Nuts are constipating, so if you’re dealing with constipation, that’s probably something that you’d want to stay away from. Jennifer: That’s good to know. Maria: Yeah, nuts and seeds for most people are just fine. If you make a dessert, you could use almond flour, better yet would be coconut flour because that’s technically a fruit. Maria: Yeah, yup. You know, from the tree. Jennifer: Yeah! I did not know that’s technically a fruit. That’s really cool! Maria: I mean, there’s arguments on it, but I find people that they’re allergic to nuts and almonds, they can tolerate coconut milk and coconut just fine. But I did want to say that a lot of times, again when you lose a lot of that water, at first, that low energy, you need to add quality salt because first of all, there’s a lot of salt in like – you’re talking about those gluten-free breads. When you’re making these whole made foods, your salt intake is really quite low compared to the packaged soups and stuff. So when you do that, you need to add in the salt and that would help with a lot of the low energy too. And good quality salt too, not just Morton’s. Jennifer: So Maria, what would a typical dinner at your house look like? Maria: Honestly, I love hamburgers. And so I have hamburger quite a bit. I put a protein bun. I know it sounds crazy, but I make a protein bun. I do a lot of avocado and guacamole on that. You could do eggplant fries with that. You could do coleslaw with that., coleslaw made with – I use the MCT oil to make a nice dressing for the coleslaw. Jennifer: I was actually going to ask you real quick because I think people might not be familiar with MCT oil. Could you just tell us what that is for those out there who have probably seen it, but they’re not certain where it comes from and what it is? Maria: Okay, okay. It’s actually from that coconut and it’s just made into a liquid form of an oil. So you wouldn’t want to make a salad dressing from coconut oil because it’s going to solidify and be hard, but MCT oil is going to stay liquid. So making a salad with that would be a wonderful way to get your ketones up there with that type of oil. Jennifer: And you could have salad greens? You could have a lot of different vegetables, yes? Maria: Oh, yes. Yes, lots of greens like we’ll do spaghetti and meatballs. We’ll make our spaghetti with zucchini pasta or cabbage pasta. That’s a really fun way. I know it sounds weird. I make it in the slow cooker. Once I had kids, I was like, “Oh, boy! No wonder why everybody complains to me that they don’t have time to make this stuff. I wrote a slow cooker cookbook that has a lot of these recipes in it. Jennifer: Wow! So you’re just shredding the cabbage? Maria: Yup. Very, very thin. And they look like long noodles. And then we top them with meatballs or whatever protein you want and that would be a great meal. And then I would serve it with a side of my protein bread made into garlic bread. Jennifer: Wow! So yeah, I’m going to have to – if you don’t mind, I think some people are going to want some links to these recipe ideas so that they could see them and see. Maria: Yeah, I know. It sounds crazy. But honestly, I love food. I always did. That’s why I was heavy as a child. I’m not going to eat bark letting people joke and I don’t want to live off of kale chips and all of that. I like food. I like a lot of food. And instead of having a half a cup of gluten-free pasta (which is going to be inflammatory), I want to have three cups of cabbage pasta and a bunch of meatballs. I’d rather have a lot of food, you know? Jennifer: You want to enjoy yourself. Maria: Yeah! That’s why my favorite are my days off that I could just work in the kitchen and cook with my kids. Jennifer: That’s awesome! Well, you know what? I want to make sure that everybody knows where to find you because I feel like this was a really good introduction to this whole idea. Jennifer: …which is totally wrong. I’ve been doing it myself and I have to say, I personally do feel a lot better. Thank you so much for being an advocate for this and showing people that you can do this in a healthy, balanced way and that you don’t have to deprive yourself. I mean, the recipes on your site, the photos are gorgeous, but they look so decadent even though it’s simple. It’s not complicated stuff. And you have eight different books available for people to dive into, but the Keto Adapted book– what specifically about this book makes it special that people might want to go and check it out? Maria: Well, what happened is I speak at different groups and I released The Secrets to a Healthy Metabolism, which has been out there for many, many years. It had such good response. And then I was speaking at a group and I said, “Who thinks this is a high-protein diet?” and they all raise their hands. What I did in that book is I talked about carbohydrates and all of that, but I didn’t explain that too much protein was turning into sugar in their diet to because it didn’t always work for people. And so this kind of puts everything into – it’s very, very detailed. It says, “If you waive this amount, here’s how you can find out how much fat grams you need a day, protein grams, xyz.” It’s very detailed so you could figure that out. There’s recipes at the end (including the ketofudge)… that would help you figure out the ratios in a recipe that would make it ketogenic. Jennifer: Wow! So you’ve really made this easy for people. You’ve simplified the whole process of figuring out how much they’re going to need and what to do. Maria: I tried to, yeah. Yeah. Jennifer: Well, people can definitely come and if they want your health (because I know that you do see clients that’s accessible. You have your services listed on your website and you also have a Facebook page as well. I definitely follow you on Facebook and see your posts go up. I enjoy watching everything that you’re doing. I really, really appreciate your time. So please, everybody, go check out Maria’s website. It’s really great. She’s got a lot of great recipes up there. So Maria, thank you so much for joining us. I really appreciate it. Jennifer: Everybody, please go stay in touch with Maria. Like we said, go visit her mariamindbodyhealth.com. And remember – please, please, please, guys – remember to subscribe, write a review this podcast. And then head on over to Gluten Free School. Leave your comments and questions on this podcast. I know that we should probably have questions and comments because this isn’t your normal run-of-the-mill gluten-free diet. This is a different way to approach it and I wanted to start tackling some tougher questions about is fat so bad for you. Clearly, Maria has shown us that maybe the negative impressions we’ve had of fat, they may be misguided and we might want to rethink that. Thank you so much for joining me. I look forward to seeing you guys the next time, bye bye. Leave a comment below sharing if you’re afraid to eat fat! This is one of the more informative posts I’ve read/listened to. Thank you Jennifer & Maria. It is refreshing to read something that is so saturated with hard facts. I too have experimented with this type of diet and it works wonders. The part that really stuck out to me was when you said that “Everybody’s body is different”. I try to hammer that point in my blog on a regular basis because too many people simply follow trends or try the next fad diet that pops up on their newsfeeds. They try a new supplement or meal plan and don’t understand why they aren’t seeing the results that were promised to them. It is all about understanding your body and what you are putting into it. The old adage “you are what you eat” could not be anymore on point! Love this podcast! Thanks for sharing. Already have all ingredients for Keto Fudge and am going to try. I also subscribed to Maria’s newsletter. Thanks again! Helpful, good info. Filled in some questions and blanks. Thank you. Coconut and tree nuts are not the end all be all of healthy eating. There are a few people, like me, who are allergic to all of them. Coconut and tree nuts cause my throat to swell. So, what other oils do you recommend? No, they aren’t Colleen. There are seeds from which seed butters and oils are derived and made. You can also use ghee or butter and dairy from other animals as well as rendered animal fats, olive oil, and avocado. Does that help?